Samuel Lalande-Markon is an adventurer, an athlete, a musician and a Quebec cultural manager. Native of Montreal, he developed a special interest in long expeditions, exploration narratives and artistic creation. Following a childhood of pretending to be a coureur des bois, as well as several years of adventures with the scouts and an initiatory 4-day trek in the woods alone at the age of 17, Samuel embarked on his first great adventure in 2011: the crossing of Canada from Vancouver to St. John’s. In 47 days, he travelled 8,329 km across the world’s second-largest country. In 2013, he was on the road once again for the United States, this time travelling 7,255 km in 42 days under difficult conditions through the Nevada desert, the Rocky Mountain passes in Colorado and the torrential rains of Missouri. In 2014, he made his way to Havre St-Pierre from Montreal in only 5 days. 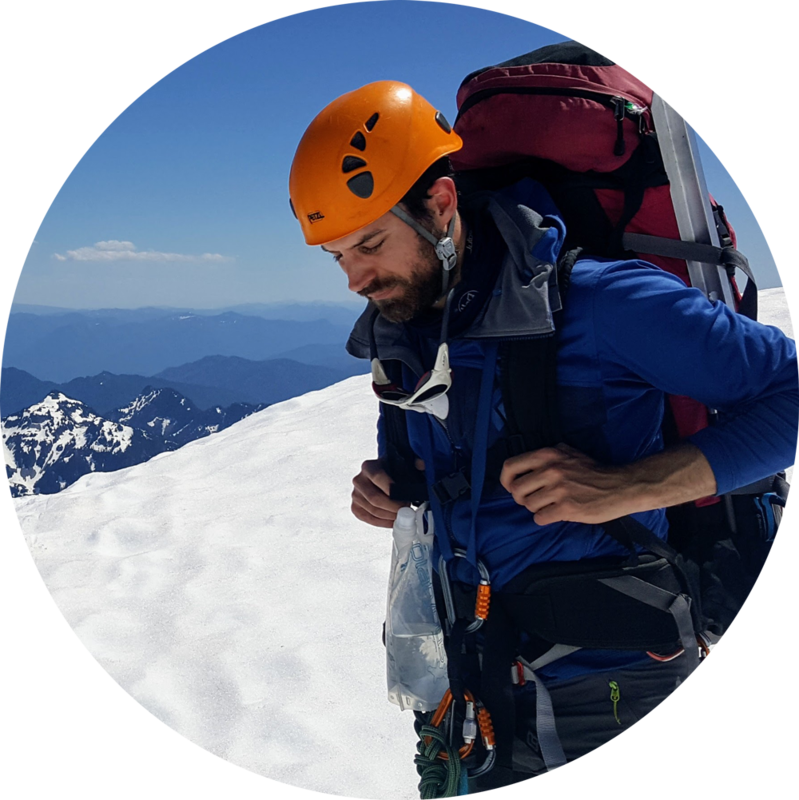 For the last few years, Samuel has taken up mountaineering, having notably ascended the Chimborazo (6,263 m) in Ecuador in 2016 and Mount Rainier (4,392 m) in the United States in 2017. Being both a sports climbing and traditional climbing enthusiast, he has scaled the iconic Grand Sentinel at Lake Louise and completed the Forbidden Traverse in the North Cascades in 2017. As a hiker, he has worn out the soles of his shoes all over the northeastern American mountains, ranging from the Chic-Chocs to the White Mountains, as well as the Californian Sierras. He also loves to run and has completed three marathons, two of which were below the 3:05 mark. Trained in interpretation at Université de Montréal and at Mannes College the New School for Music in New York, Samuel has played as a supernumerary tuba player in several ensembles around Greater Montreal, such as the Orchestre symphonique de Montréal and the Orchestre Métropolitain. In 2007, he founded Magnitude6, an ensemble of contemporary music of which he became the artistic and managing director in 2010. Samuel advocates a multidisciplinary approach of musical creation through collaboration with artists from all backgrounds, with on-site events and the integration of digital audio technology. Samuel also has a diploma in Management of Cultural Organizations at HEC Montréal and works in communications with Les Boréades de Montréal, an ensemble of baroque music. In recent years, Samuel has been seeking to bring together his artistic practice, his interest in history and his taste for adventure. The Trans-Taiga Expedition that he will undertake with David Désilets from Montreal to Kuujjuaq during the summer of 2018 will allow him to make this vision come true.